IN LSAMP provided a team of mentors to guide Salvador through the REU application process. Dr. Michael Hall, IN LSAMP Campus Director, managed academic and technical preparation, Jorge Lopez, IN LSAMP intern, managed professional development, and Michelle Quirke, Project Manager for IN LSAMP, supported the application writing and submission process. An accepted application is just the first step to a successful summer. I have received so much support from a lot of people around me and I would like to do the same for future students. To achieve this, of course, my academic plans are to keep in school and work my way to a PhD and, subsequently, a Post-Doctoral (degree). Valle worked in a lab researching electrodeposition of germanium telluride. He shares recollections from his journey. On his way to Illinois, he worried about expectations and what, if anything, he would be able to deliver. As it turned out, the actual outcome of the research was secondary to what Salvador learned about where he wanted to go with his future career path. Salvador shared advice from his experience with the application process. 2. Focus on your project but find time to learn other things. By broadening your focus, you may discover other interests and make valuable contacts in the scientific research community. Get out of the lab and learn about other aspects of research. 3. Don’t worry so much about results or accomplishments. Remember the experience and how it prepares you for your academic career is the goal. 4. At a practical level, understand your home-away-from-home living arrangements. Salvador found himself in living quarters without cookware. As someone who enjoys cooking, he values the comfort of a home cooked meal. Salvador recommends maintaining an open and inquisitive mind, anticipate the unexpected and remember to take care of yourself while working away from home. Back home, Salvador continues to practice this philosophy and stay involved with IN LSAMP and his campus network. When IN LSAMP Campus Director and Biotechnology Program Chair, Dr. Pappas, coordinated donation of microscopes from the Medical Assisting Program to the Biotechnology Department for students. 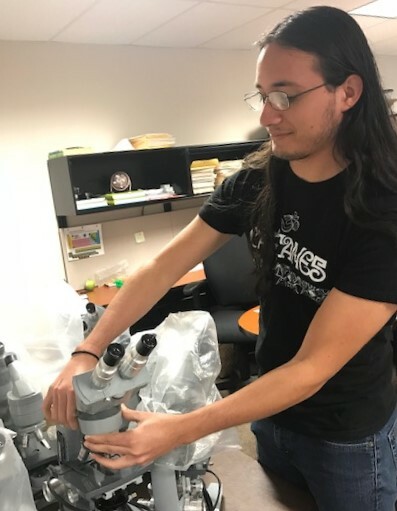 Salvador picked up microscopes for club activities with the Ivy Tech Engineering Society (IES).